(I No. 3) Preliminary Chart of Galveston Bay Texas. An uncommon 1855 U.S. Coast Survey nautical chart or maritime map of Galveston Bay, Texas. The map covers from Turtle Bay to the entrance to Galveston Bay, including the City of Galveston, Galveston Island, and Bolivar Peninsula. Supplementary inset maps in the upper left quadrant detail Cloppers Bar and Red Fish Bar. 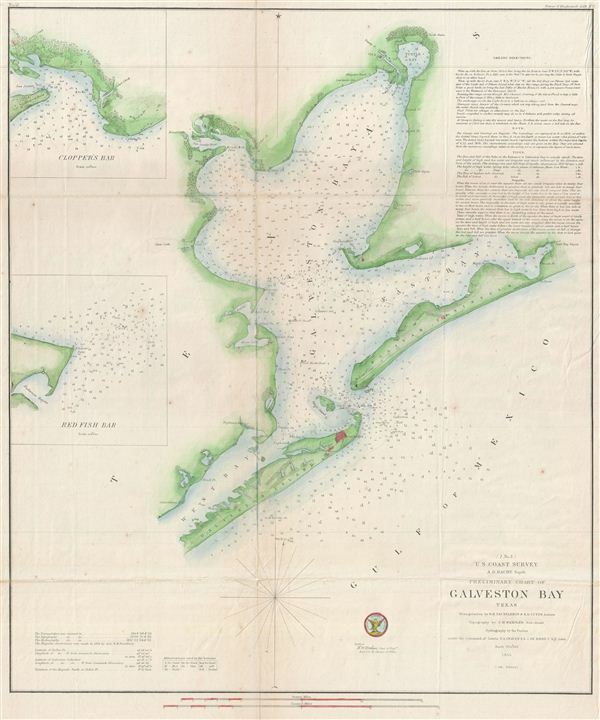 This is the fourth edition of the U.S. Coast Survey chart of Galveston Bay. Issued on a scale of 1:200000. The triangulation for this chart is the work of R. H. Fauntleroy and R. D. Cutts. The topography was completed by J. M. Wampler. The hydrography was accomplished by a team under the command of T. A. Craven and e. J. de Haven. The whole was compiled under the supervision of A. D. Bache, one of the most influential Superintendents in the history of the Coast Survey. Published in the 1855 edition of the Superintendent's Report.